Lloys Bank offers low administrative account charges which helps to offset providing clients average research and a basic platform and tools. Lloyds Bank started life in 1765 in Birmingham as Taylors & Lloyds. It was founded by Sampson Lloyd II, John Taylor, and their two sons, each of whom invested £2,000. Lloyds Banking Group was formed in 2009, bringing together well-known brands, including Lloyds, Halifax, Bank of Scotland, and Scottish Widows. 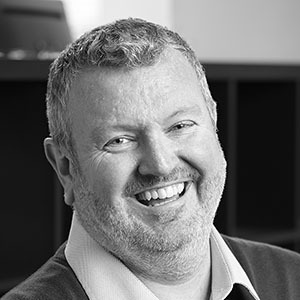 The combined history stretches back more than 300 years and encompasses a diverse business range. Lloyds Bank is the largest retail bank in the UK, and the banking group serves more than 25 million customers. One important note here is that the Lloyds share-dealing service is very similar to the Halifax share- dealing service, given the common parent group, although the respective services have different offerings and pricing structures. Charges are made on both a per deal basis plus a £20.00 managerial/administration charge (which is waived if the account is held with a share-dealing ISA). Online trading fees in equities are above the average among UK brokers, with fees at £11.00/trade for the first seven deals per quarter, then £8.00 for each deal over eight in any quarter. Further discounts apply for Lloyds Premier and Private Banking clients; the first seven deals in each quarter are discounted to £10.00/trade, and the six-month charge down to £10.00. The cost of trading funds is £1.50/deal. The absence of a percentage managerial /custodial fee for funds would be attractive to fund investors, particularly those that are relatively inactive. However, for frequent traders in individual equities, more attractive price structures are available elsewhere. 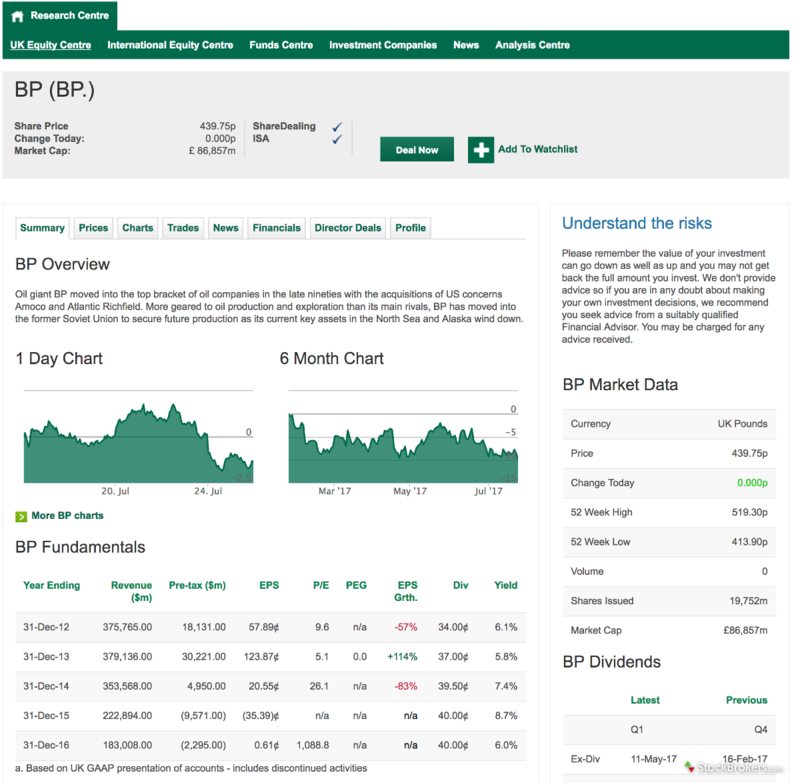 The Lloyds share-dealing platform provides a solid and comprehensive fundamental and macro-economic research service. However, practically all the information and data are provided by third parties from outside the account holder platform and are therefore accessible by non-account holders. Being a sister brand, the structure effectively replicates what is available via the Halifax share-dealing service. 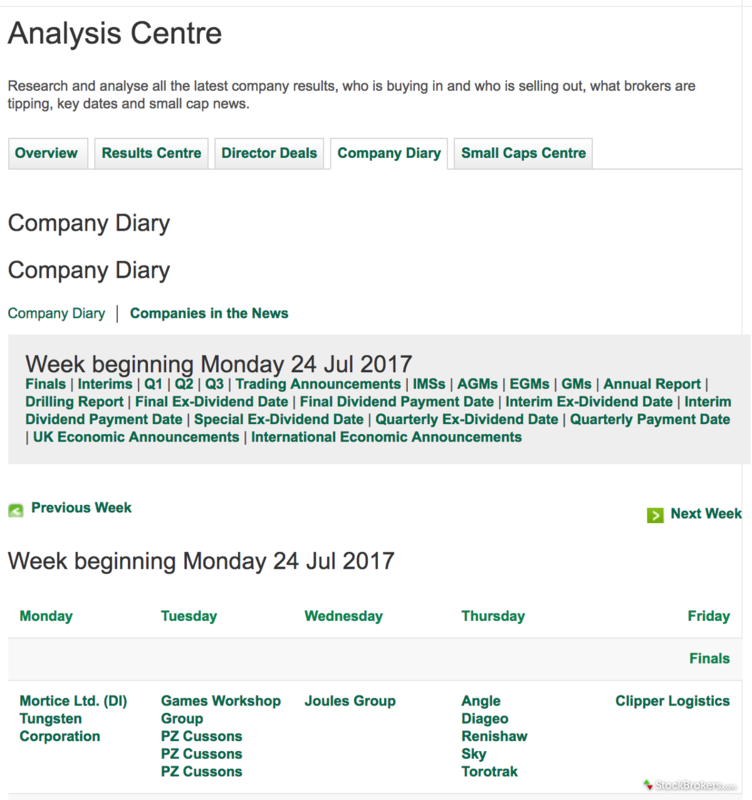 Two worthy research areas to highlight are the Company Diary and the Company News sections. These areas deliver news and material regarding dividends, directors’ dealings, and numerous miscellaneous company announcements. The Company Diary is a weekly economic calendar presenting data that can be filtered by various factors (international economic data, annual reports, interim and final results). This tool is not offered by many brokers and is a strong added value. Furthermore, links are provided to download third-party company reports provided by The Investor Network. This is a service that is accessible whether you are a Lloyds share-dealing customer or not. The charting package offered by Lloyds Bank’s share-dealing platform is basic, in line with the average offered by major UK online brokers, and again, it replicates the offering from Halifax. It is possible to adjust the chart type (line, candlestick, area, OHLC), to compare to indices, sectors, or other stocks, to add in three moving averages, and to view limited fundamental events on the chart. However, outside of the moving averages, no other technical indicators or drawing tools are available. With respect to fundamental tools, the following are available: watch lists, performance tables, stock screeners, and heat maps. 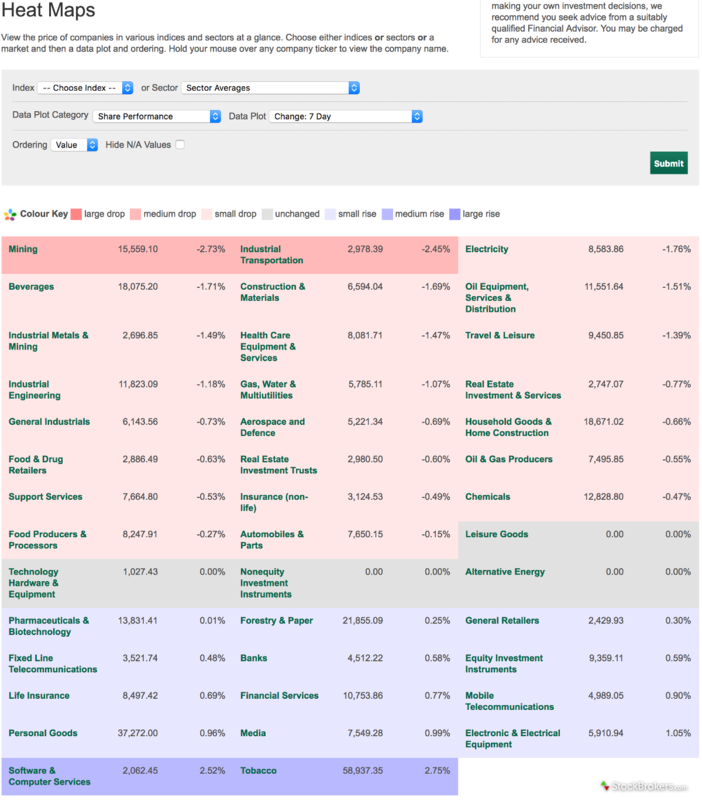 These are user friendly and make the analysis of different stocks and sectors based on various metrics very easy. Once again, all the benefits from the charting platform and analysis tools are available to non-account holders, as they are not limited to the account holder’s domain. The Lloyds share-dealing service does not offer any dedicated mobile applications, but there is a responsive mobile site available for use on phones and tablets. While I felt the responsive mobile site was as good as an app with respect to account management and trading, it was not as functional or as user-friendly for conducting research and trade tools. The educational provision on the Lloyds Bank share-dealing site is very limited. A basic, one-page overview of considerations new investors should make before investing in shares is far from impressive. Considering the elevated position Lloyds Bank and the Lloyds Banking Group has within the UK banking community, I expected a more thorough offering. Lloyd Bank’s offering is very similar to Halifax’s share-dealing service, given the common parent group. However, the differences in pricing structure may influence potential clients. This is especially true for current Lloyds Premier and Private Banking clients. Lloyd Bank’s general service is solid, with comparatively low fees and charges (for larger investors or infrequent traders). The trading platform and research areas are lower in quality than those offered by their UK competitors; however, the low price may be enough to attract customers willing to overlook these drawbacks. Select one or more of these brokers to compare against Lloyds Bank. Find out how Lloyds Bank stacks up against other brokers.